I finished my Garden Stroll Quilt last night. 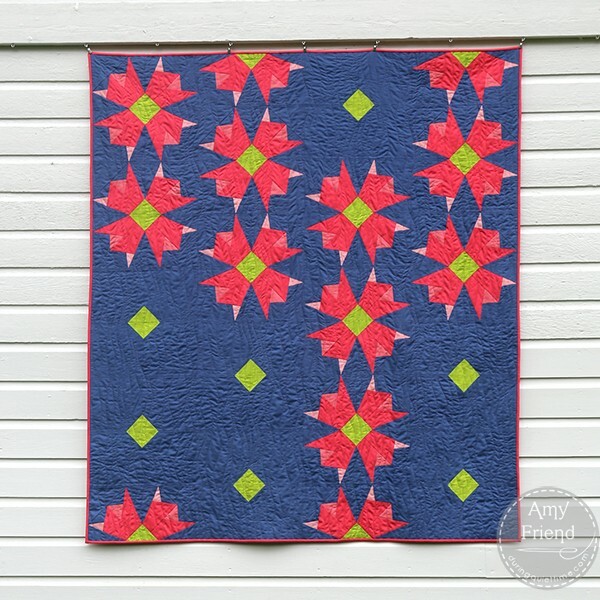 This is a paper pieced quilt with lots of interesting negative space but block based putting it squarely in the modern traditional category, I think! All of the blocks are pieced but you get a break on the blocks with just the chartreuse diamonds because they are simple and quick. 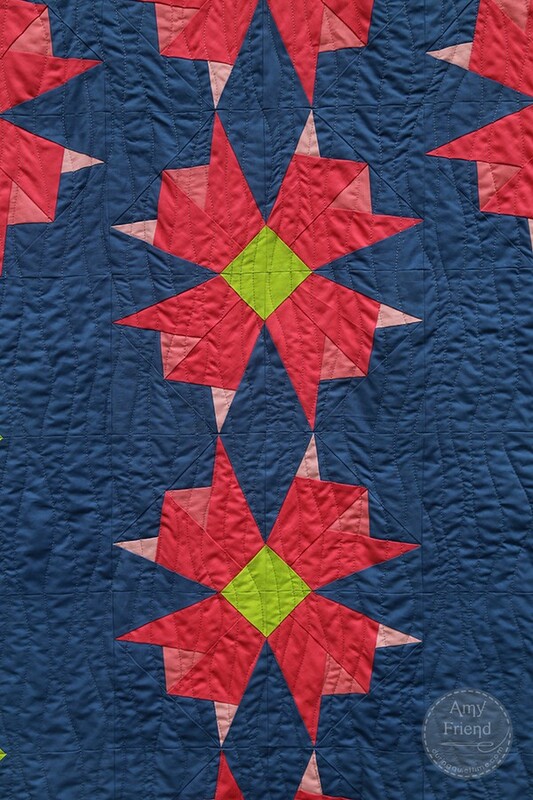 The quilt is made using 5 solids–blue, chartreuse, light pink, medium pink and dark pink. 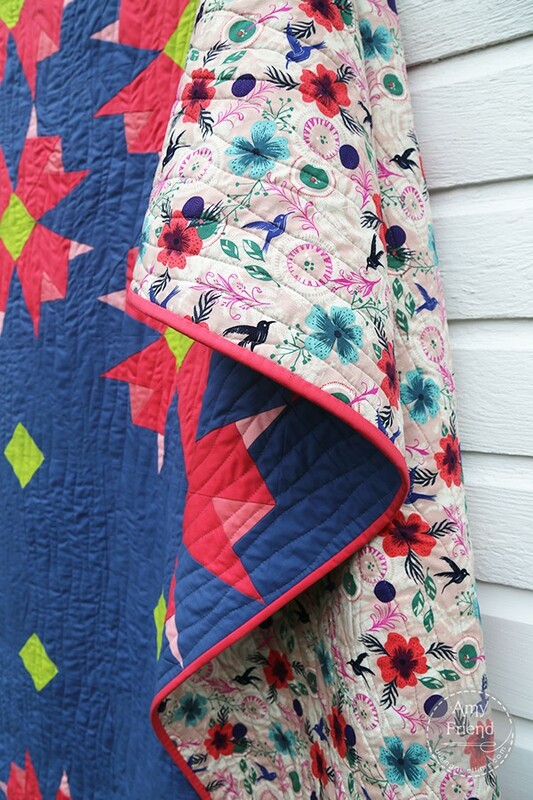 You could make scrappy flowers from prints too! I was going for a bold, graphic look so I felt that solids would do that best. I wrote about my color palette recently if you missed it, you might find it interesting. I chose to quilt with organic, wavy, vertical lines using a medium shade of grey Aurifil that I thought blended pretty well through the range of colors. I hoped that the wavy lines would give the sense of a stroll through meandering paths in a garden and add some movement to the quilt. I like the fact that they do a good job of obliterating the block seams from just a short distance away. I picked up a fat quarter stack of Honeymoon by Sarah Watts for Cotton + Steel while at market this spring. It was sitting out in my sewing room (due to lack of space in the fabric hutch!) and caught my eye. I thought it would make the perfect backing for this quilt. I ordered some yardage from The Fat Quarter Shop. I will have this pattern available for sale shortly both as a pdf and paper pattern. 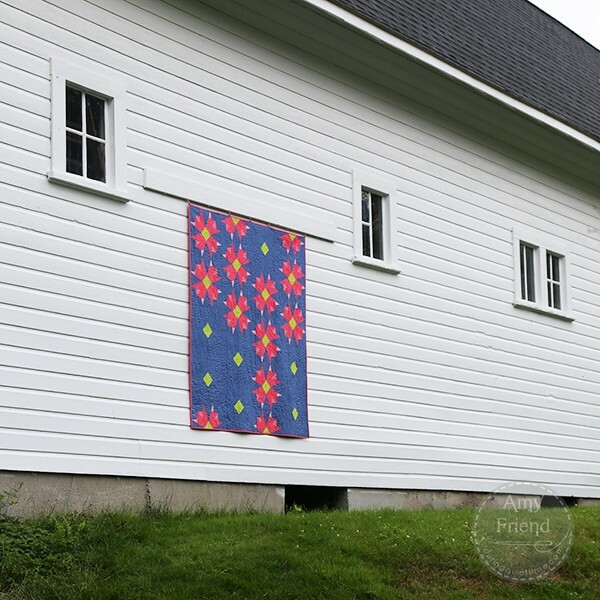 This quilt measures 60″ x 67 1/2″ finished.